It's great to use them on wedding invitations, gifts, presents or other stationary! The Seal head is removable! It's easily install or exchange to a different stamp! Stamp the monogram or your own design on invitations, it's pretty cool! We can do custom stamps! Just send the picture of your design to us, we'll make it happen! We can do different sizes stamps, and differenct shapes stamps. Stamp Symbol: Snake Animal Decorative. It's great to use it on wedding invitations,letters or other occasions! It's pretty cool! 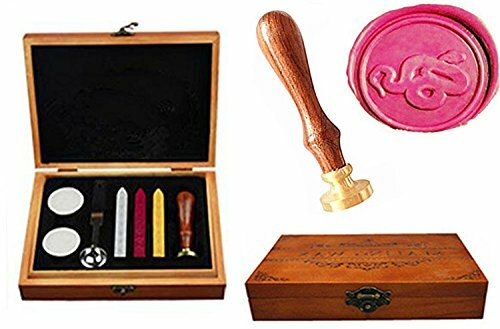 Package Includes: 1*Wood Gift Box; 1pc * Wax Stamp(Rosewood handle & Copper head), 1pc* Melting Spoon,3pc* Sealing Wax Sticks,2pc*Lighting Candles.It's great to use it on wedding invitation label, party invitation letter or other occasions! It's pretty cool! Box Sizes:19.5 * 15.2 * 4.7cm (7.7 * 6 * 1.28inch) . Wood Gift Box packaging design, makes it like an old mysterious book. Creative gifts for your friend or just for collection! Seal Diameter 25mm/30mm,depends on the design . If you want other sizes, an additional fee may be charged. :) Seal Head Material: Copper. The Seal head is removable! It's easily install or exchange to a different stamp! If you have any questions about this product by MNYR, contact us by completing and submitting the form below. If you are looking for a specif part number, please include it with your message.